Keep daily gear secured and accessible using the 2" Duty Belt from High Speed Gear. As a law enforcement or tactical professional, a lot of equipment is required as standard wear on a daily basis. 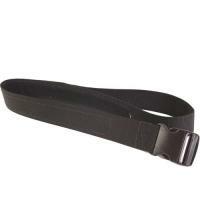 The weight of sidearms, handcuffs, flashlights and other necessities quickly add up and a typical belt will not cut it. High Speed Gear's ultra-tough duty belt is constructed from military-grade nylon in order to provide the strength needed to handle the demands of tactical application. The reinforced, quick-release buckle offers a secure fastener that is easily removed when necessary. A loop-lined interior is ideal for securing hook backed accessories and providing additional reinforcement and securement power when needed.